Debby Kratovil Quilts: What's a Quilt with Two Missing Blocks? 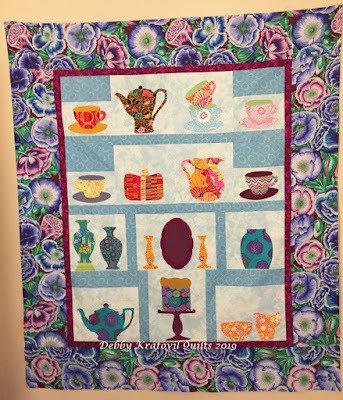 I finally put together my Tea Party blocks which I featured here in 2018 - one a month. But, for some reason I didn't count yesterday when I put them into a quilt. I'm missing the November and December blocks! I didn't realize it until today - too late! Quilt top is done and I'm NOT going to rip it apart to add the two renegade blocks. They are shamelessly hiding in my sewing room getting a big kick out of giving me more gray hair. Here is the quilt. Very organic. Blocks are a variety of sizes, but the patterns I gave here were for a standard 10" finished size. I don't want to give you gray hairs! My Tea Party Quilt: 49" x 56"
If you want to see the various posts of these blocks, and quite a few process shots of how I constructed them, go to the Search window over on the right sidebar here and look for them in each month for 2018. Or, you can find the links when you click on "2018 Tea Party" as a link in "labels. You can get more info about this 25 page pdf by visiting the link (2018 Tea Party Blocks). And if you happen to see a runaway Crock or Candy Dish, will you let them know I miss them!?! Ha ha ha. Your quilt turned out beautifully Debby even though some of the blocks are missing. But no one will notice if you don't say anything. I love the colors. I thought I downloaded all the blocks and did them but I don't remember ever downloading the platter. What month was that one released? Darling quilt - thanks for sharing.